Mom’s Natural Health & Wellness opened it’s doors online in July 2010. Now to celebrate one year of offering affordable quality natural and organic health and beauty products for women and children the online retailer has added a premier discount club for it’s customers. Free to join members will receive new product updates, and special coupon codes just for them. Mom’s Natural Health & Wellness already saves customers time and money by offering the lowest online prices for natural supplements, herbal remedies, aromatherapy, vitamins and natural cosmetics. The new discount club is designed to help families save even more money on their natural health and beauty needs. 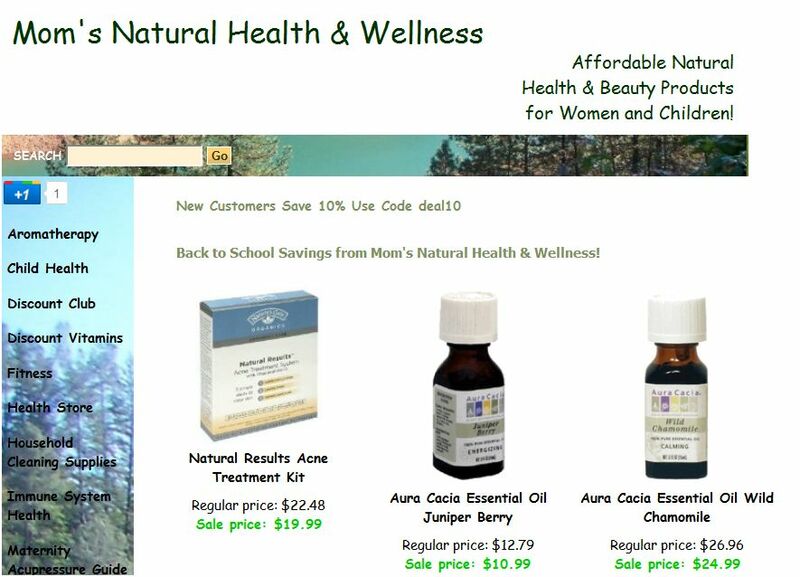 In addition to the discount club Mom’s Natural Health & Wellness has a complete new design and look to their store. “We want our customers to have an easier time navigating the site and find the information they need on top quality natural health and beauty products. The new site is less spammy and puts more emphasis on the products that we offer instead of outside sources.” Cascia Talbert, owner of Mom’s Natural Health & Wellness stated. For more information on how you can join please visit: Mom’s Natural Health & Wellness Discount Club. You can also visit their Facebook Page for more special deals, discounts and natural health giveaways.